Lt and I love to walk. We try to walk at night in the neighborhood and click off about 2.5 miles. So as we are walking, we notice this house. It still has Christmas lights still up in the house! Not only that but the Christmas tree is still in the window, lit up! Sorry for the dark picture. Lt would not use the flash and draw attention to us! At first, I am totally freaking out! What is with these people keeping their decorations up? Don't they know to take them down by the first week of the new year at least? Are they lazy? You see, I don't decorate much over the holidays because it is just Lt, Gavin and I. We have no children (and don't plan any either). I do stocking stuffers with my sis and bro-in-law, but take them to their house. So I don't see the need to put up a tree and I also dread taking it down. Hence: no tree. I do a lot of other stuff, but no tree and definitely no lights inside. 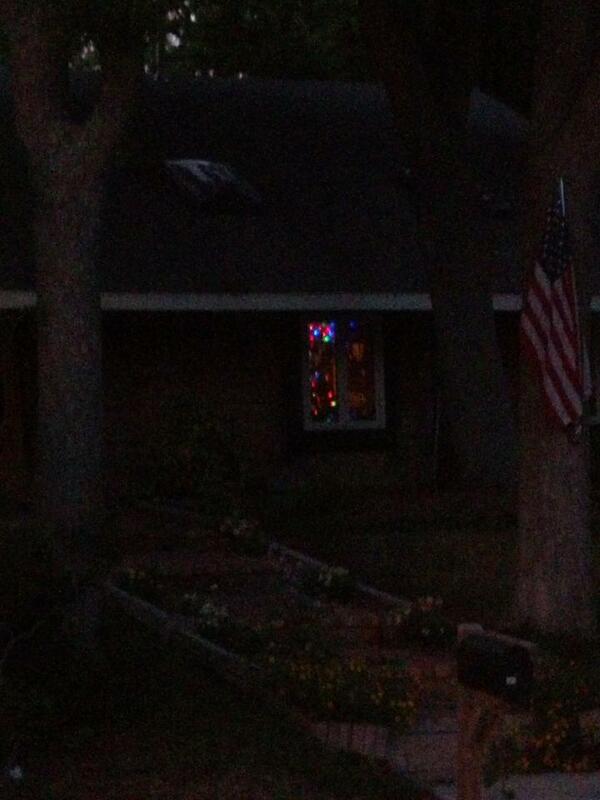 So I just can't figure this house out that has their lights and tree still up. 1. How cool this family has decided to buck convention and do their own thing. They are not trying to "keep up with the Jones's" or conform. They are doing what feels good to them. What they enjoy. 2. Christmas time gives you the warm fuzzies. Who wouldn't want to keep Christmas up all year to have those feelings! 3. Christmas is about the birth of our Saviour. Maybe the tree and lights is a way they have decided to keep this in their minds and hearts all year. 1. Freaky dinkies! Who keeps their tree and lights up all year? 3. I hope the tree doesn't have decorations still on it. That would take freakiness to a whole new level. I don't know what I really think about this. Every time I walk by this house, it just makes me shake my head. I lean toward the positive thoughts and let that family enjoy themselves. It also gives the neighbors and neighborhood something to focus on other than their issues. What are your thoughts about having Christmas lights and trees lit up in the house in May? I am also linking up with Amanda of Rhyme and Ribbons who is co-hosting a Mingle Monday. Just felt like getting out there and shaking some things up today! Welcome everyone! Enjoy my wanderings. Feel free to leave a comment or email me. I love to talk, if you haven't figured it out by now! !